The saying goes that we learn from our mistakes. I hope that’s true. But the question for these travel writing tips is - can you learn from mistakes of others? Although I’ve had a lot of success, I’m going to share the things that didn’t go so well in my first few years of freelance travel writing. If I had to do it all over again, these are the things I would do differently and why it matters. This letter is written to myself outlining the mistakes I've made. These errors cost me time and money, and hindered my progress as a travel writer along the way. You can use it as a checklist to see if you’re making the same errors. And if you can learn from my mistakes, you can make course corrections in your own travel writing journey. Here’s my letter to myself, back when I was a rookie travel writer . . .
It’s 2017. I’m writing to you one decade from the date you began your career as a freelance travel writer. Don’t be shocked! I’m here to help. The main point of this letter is to tell you what you could have done better on your travel writing journey. Yes, you did some good stuff. I’ve included that at the end of this letter just to keep it balanced. But here’s my advice for the things you could have done better. Do yourself a favor and fix these things. Save yourself time and grief. And if I seem like a harsh critic, well, if I can’t give you feedback, who can? You didn’t have a writer’s website for your first two years of travel writing. What’s the deal with that? Once you got your act together and got a website up, you noticed a surge in interest from magazine editors. More importantly, it saved you tons of time sending links and PDFs to editors. One link to your website was all they needed. There were even editors who found you through the articles posted on your writer’s website. They gave you paying assignments! But only when you became visible online with a professional writer’s website. If you could do it over: Don't procrastinate. Get your writer’s website up and running as soon as you have 10-15 bylines. It’s easy to do these days and doesn’t cost a bundle anymore. And if you don’t have the time or know-how to do it yourself, hire someone to do it for you. It will be money well-spent. In your early years you worked with a couple of editors who were less than professional. You gave them the benefit of the doubt and trusted them, and then you got stiffed. It cost you time and money. And unprincipled editors take their toll emotionally, too. If you could do it over: Ditch the dodgy editors the moment those alarm bells start ringing in your head. Don’t give them the benefit of the doubt and hope things will get better. They won’t. You’ll save a lot of time and emotional energy if you just dump them and move on. Buy a Better Camera Now! Why did you wait so long to purchase a high quality camera? It took no time at all to understand most editors depend on your photos. Yet you resisted, because you worried about the technology. Then one day in your fifth year (!) you were standing on the deck of a ship looking around you. Everyone was shooting with a DSLR. Teenagers, retirees, and everyone in between had a better camera than you had. That little point-and-shoot seemed pretty pathetic that day, didn’t it? If you could do it over: Man up! Get a decent camera with a good travel lens now! Most editors depend on high quality photos so stop stalling. Even a non-techie like you can learn to use it. These days it doesn’t have to be a big DSLR (although they’re still superior) and it doesn’t need to be the most expensive camera out there. There are mirrorless cameras that also produce magazine quality images. Either way, ditch the point and shoot. And don’t try and substitute a smart phone. For most print magazines, they’re still not good enough. Smartphone photos may be good enough for Facebook and many websites, but for print you need a camera with a high quality lens. Remember sending your photos as email attachments, way back when? That didn’t work out so well, did it? Your emails kept bouncing back because of the large file sizes. What a pain! Then for a while you mailed out all those photo CDs to magazine editors? That didn’t work out so well, either. That meant creating the CD, packaging it for shipment, trips the post office and the postage. It cost you a lot of time and money! Dropbox didn’t work so well, either. It was unwieldy to use, easy to screw up, and tough on editors. If you could do it over: Finally you got it right when you set up a Smugmug photo gallery. For only $60/year! Far less than the cost of sending CDs in the mail, I might mention. Circumvent all those cumbersome and quirky photo transmission modes by using a photo gallery app like Smugmug! You can reuse your galleries when you resell your articles – so you save lots of time. It’s hassle free and editors love it. It took you two long years to figure out the press trips game. Talk about a slow learner! You funded your travels with your own money and it held you back in so many ways! Dude, DMOs are paid to help arrange travel for writers who have assignments. Hotels, meals, transportation, guides, complimentary entry to tourist attractions, interviews with people you need to meet - they’re there to help make your visit productive. It’s their job! And as a travel writer you can legitimately request assistance with your travel. These comps save you money and time. The DMOs set up your itinerary and you just show up and follow the game plan. And you travel better - staying in better hotels, eating in better restaurants and having a better experience. If you could do it over: Contact DMOs and apply for press trips as soon as you have an assignment. Let them know what you need to produce a good article. They need journalists with assignments, and they love people who write in multiple genres. You weren't consistently pitching high-paying glossies at the start. Maybe it was lack of confidence. But you should have been pitching them early on. It would have boosted your confidence and you could have made more money. It turns out that your story ideas were solid and your writing skills good enough to get your stories published in top-shelf magazines, when you finally focused on pitching them. If you could do it over: If you have a solid story idea, pitch the high-paying glossies right from the start. Even if your stories are rejected you’ll learn from it and know what to do when you try again later. Why did it so long to break into luxury travel writing? Oh, that’s right. It was your wife who decided to research high-end resorts instead of the budget hotels you suggested. That’s what finally launched you into this genre. If you had focused more on luxury travel stories and luxury magazines in your first few years, you could have been scoring those plush luxury fam tours way earlier instead of staying in budget hotels. If you could do it over: Set your sights higher from the beginning. You eventually experienced the joys of staying in luxurious villas and even castles. You happily endured a smorgasbord of spa treatments along the way. You sampled over-the-top cuisine (and ruined your waistline). You enjoyed personal concierges, customized tours, and other pampering without complaint when you decided to break into luxury travel. If you can get an article published about it, there are many luxury venues and premium adventures willing to host you. You resisted the awesome power of the social media for a long time. You didn’t start Facebooking until December 2014! That’s seven years! What’s with that? The problem was you had it in your head that it wouldn’t bring in many writing assignments, and that’s true. And you were distracted by all those lame social media posts. But you didn’t have to buy into that! It's easy to do quality posts. If you could do it over: Get with the social media program! Get yourself on Facebook and other mainstream social media. There’s a whole social media world out there – use it to actively promote yourself and your work. Social media helps with credibility. 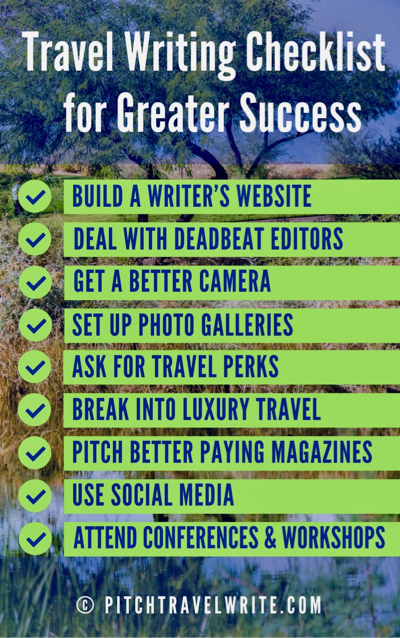 You can promote yourself, your writing and your travel in a professional way. And it’s one of the first places editors go to check out new writers. You have to be there. You were so busy pitching articles and writing them that you forgot there was anything else - like a network out there to help you grow and develop. You could have been networking with other writers, meeting magazine editors, and learning more tricks of the trade, a lot earlier. Attending local and regional conferences early on would have improved your learning curve. (You learned about DMOs at a regional conference.) And you should have been attending national travel writer’s conferences and other special events, trying new ones each year. If you could do it over: I know it’s hard to spend the time and money to do these things, but every time you attended a conference it paid off quickly with new contacts, assignments and press trips. You also made new writing friends. Attend at least two conferences each year and you’ll stay up with the latest travel trends and expand your network. It will plug you into the travel writing community. You understood the importance of selling and marketing quickly. As you discovered, selling and marketing your travel stories is the lifeblood of freelance travel writing. And you had the sense to write in multiple genres. It helped you get published more frequently and faster because you had a broad range of interests. This opened up many more markets for your writing. You’re now regarded as one of the most prolific and diverse travel writers in North America. It wasn’t your goal but it’s a nice achievement. Who knew that would happen?